In February 2017, California's Oroville Dam received national attention as a narrowly averted flood disaster. A decade earlier—in June 2008—it was Wisconsin's turn: Near the popular tourist destination city Wisconsin Dells, excessive rainfall eroded the highway that formed part of the Lake Delton Dam, resulting in a torrential washout into the Wisconsin River 40 feet below. It swept away three homes, destroyed two others, and left the lake drained for months. At the University of Wisconsin-Madison, these and many other examples motivate Civil and Environmental Engineering Assistant Professor Daniel Wright to help improve the nation's flood risk preparedness. "Many of the 80,000 dams in our country, especially the 90 percent classified as smaller, have similar structural problems as the Oroville Dam," Wright says. "We know it's just a matter of time until a big rainfall will overwhelm the next one—but unfortunately, this problem is not yet receiving enough attention." Wright hopes to change that with the aptly named RainyDay software: a planning tool he and his colleagues developed and published, in April 2017, in the journal Environmental Modelling & Software. Equipped with about two decades' worth of past rainfall and land cover information from modern satellites and weather radar systems, the software uses computer simulation to predict the probability that a region of interest will be hit by a major flood in the next few decades. These long-term predictions—made possible by powerful processors in the UW-Madison Center for High Throughput Computing—are more accurate than traditional calculations of flood probabilities that rely on simplifying assumptions, such as a constant climate and a lack of land use changes over time. "The RainyDay software does a better job accounting for the chaotic and complex nature of rainfall in flood prediction models," Wright explains. 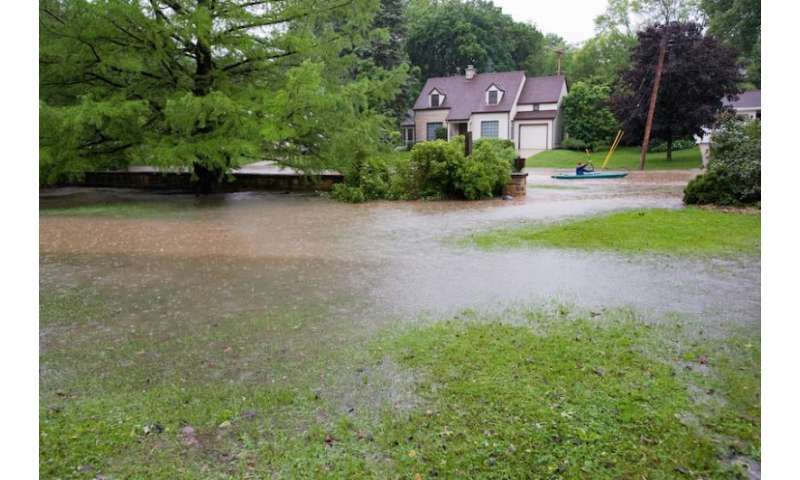 "This is particularly important for urban areas that will experience the biggest change in flood frequencies, mostly because continued urban development will increase impervious surfaces, leading to much greater rainwater runoff during a major storm." While the mathematical technique implemented in the software was proposed in the 1960s, Wright says its full potential could not be unlocked until enough satellite and weather radar data had been collected, a process which began in earnest in the late 1990s at NASA, NOAA, and other government agencies around the world. Now, the wealth of that data replaces the assumption that rainfall is uniformly distributed across an entire watershed, or within a city whose built environment, pumping stations and drainage infrastructure change over time. Since satellite data are globally available, RainyDay can also be used in developing countries that often lack extensive ground-based weather radar and other observation systems. Wright has already reached out to several partners for whom RainyDay may be a useful long-term planning tool. At the federal level, they include the Army Corps of Engineers and the U.S. Bureau of Reclamation, charged with reducing damage from natural disasters by managing large dams and other flood-control infrastructure; at the local level, he is exploring possible collaborations with the Milwaukee Metropolitan Sewerage District, which owns hundreds of miles of storm sewers and is building a large storage and conveyance tunnel to mitigate flood damage to Wisconsin's largest city. Wright notes that improved weather forecasting methods and modern forms of communication—smartphones, internet, and social media—have made it much less likely for a disaster as devastating as the Great Mississippi Flood of 1927 to occur today. Affecting an area 45 times the size of Houston and more than 630,000 people in Arkansas, Mississippi and Louisiana, it was the most destructive river flood in U.S. history. But that doesn't mean we should sit idle, especially since flood risk management is one of the most cost-effective strategies for preparing cities for the future, Wright says. Reducing a city's risk of earthquake damage, for example, often requires some form of intervention for almost every building in town. Existing structures have to be retrofitted and future buildings have to follow higher construction standards. "But we can build a flood wall or pumping station to protect an entire neighborhood from rainfall-driven hazards, with economies of scale reducing the per-building price tag," Wright explains. "By taking advantage of today's computing power to better predict these hazards for a region of interest, tools like RainyDay can assist in making the most cost-effective decisions about new or existing flood-control infrastructure."